Fairing is hard. It’s hard work, and it’s hard to get right. 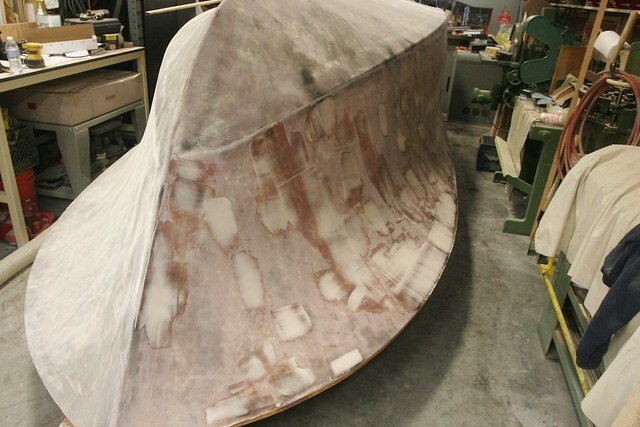 Since the glass went on the work has focused entirely on fairing, and it’s slow going. First, we sanded everything smooth with a Festool dual action, and then went to work with the linear sander and sanding blocks to try to knock things into shape such that it was “locally fair.” These tools will knock down high spots in a 10″ (ish) range making things pretty good. As we went, we’d fill depressions and sand things fair again, occasionally misting the boat with hardware store spray paint as a guide coat. 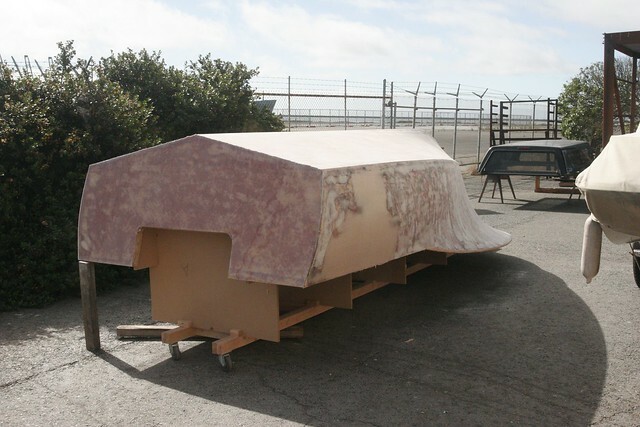 In our case there are some larger scale “whoopdie doos” that needed to be addressed that short fairing tools won’t find. 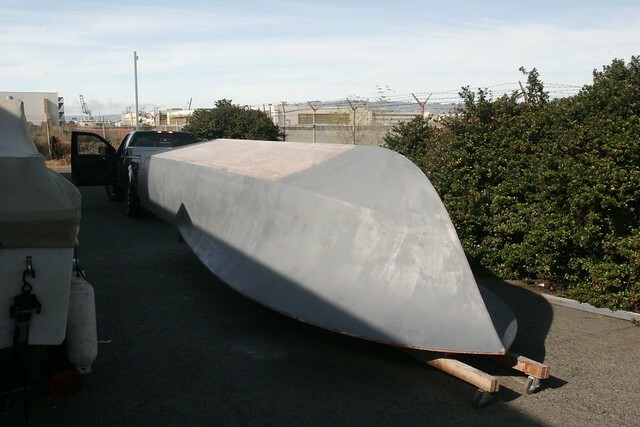 So we started using long fairing battens to screed filling compound and begin making things good at a macro level. Part way through this process, we realized that we really needed to see the boat from further away than we could get in my little shop, and under better lighting and so, in a departure from “the plan,” we wheeled the boat into the great outdoors. This helped a lot and we were able to better address some of the bigger issues in the aft portions of the hull. At this point, the fact that the hull is so mottled was beginning to be an issue. All the various color blotches bear a striking similarity to the camouflage paint jobs they use to hide the lines of cars when testing cars them in secret on city streets. And so, after consulting with the paint guys at Svendsens, I rolled on a coat of gray AwlGrip epoxy primer to even out the color so we can see imperfections better. It doesn’t really count as “primer” yet, given there’s still a lot of fairing to do, but it looks really cool with an even coat of color on it. Tomorrow is an off day, but Monday we’ll be back at it. Hopefully by the end of Tuesday the hull will be fair enough to call “done,” and we’ll move on to installing the spray rails and guard strips. I’m ready to get to painting! 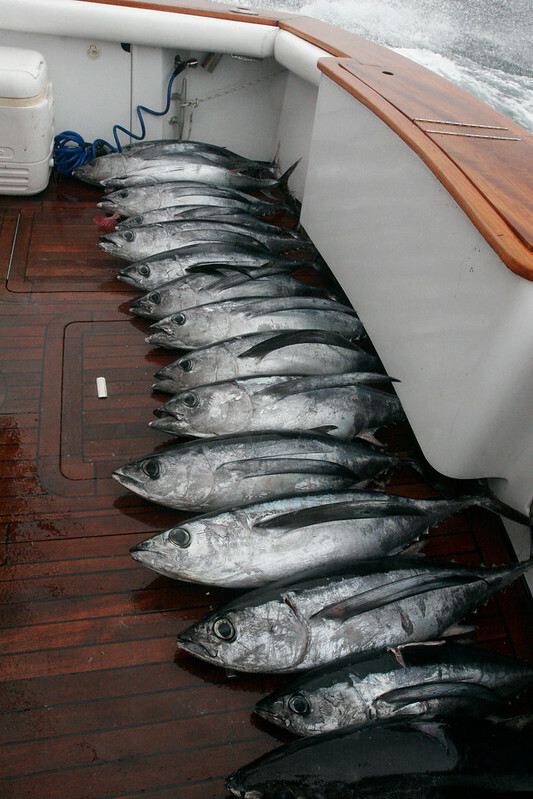 Oh, and I took Monday and Tuesday off to do some fishing in the big boat. Went pretty well! Hello, I am H.-Joachim Kleine from Germany. not that I´m keen on fishing, but I´like the Carolina Style. After looking several times on the website of Smith Marin Design, I finally found your blog and I admire what you´re doing. It´s good to see all the difficulties, before starting to build myself. I would like to combine the Kitty Hawk 26 with a flat superstructure in the front half, to have room enough for two to sleep,cook and a little head.